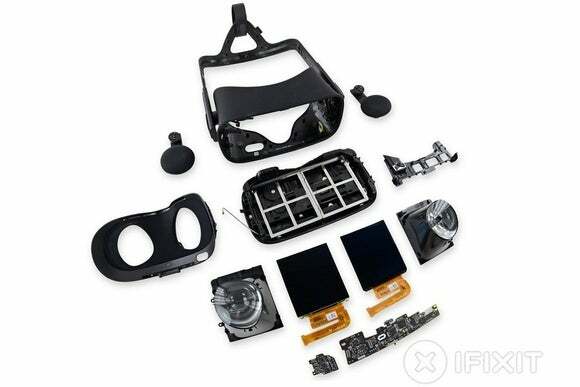 For evidence of how far the Oculus Rift has come, look no further than iFixit’s teardown of the consumer version. Upon cracking open the high-end VR headset, iFixit discovered a custom display, along with special lenses to make the Oculus more comfortable. It’s a far cry from the Rift’s early days as a crude developer kit literally taped together with off-the-shelf smartphone parts. The most noteworthy find in the teardown is what iFixit calls a pair of “hybrid Fresnel lenses.” Fresnel lenses use thin arrays of concentric prisms, achieving a large viewing angle and short focal length with far less material than traditional curved lenses. But unlike a typical Fresnel lens, Oculus’ lenses include a sloping layer on their backsides, sort of like a traditional lens. The result is a that’s lighter than previous Rift versions, and that allows users to adjust focus simply by moving the headset higher or lower on the face. The consumer Oculus Rift also makes use of dual custom OLED displays, instead of just borrowing panels from existing smartphones. Each display has as resolution of 1080-by-1200 and measures 90 mm diagonally, for a density of 456 pixels per inch. That’s more than an iPhone 6s Plus (456 ppi), but less than Samsung’s Galaxy S7 (576 ppi), would normally have to be viewed from at least 8 inches away for individual pixels to be indiscernible. However, the Rift’s lenses make the screen seem farther away, so those pixels are still tough to make out. Aside from the fancy lenses and custom display, iFixit observed that certain parts of the Oculus Rift are fairly easy to replace, such as the built-in headphones and face pad—good to know if you’re dropping $600 on state-of-the-art VR. The same can’t be said for the Rift’s lenses, displays, and motherboard, so odds are you’ll be sending the headset back if anything goes wrong with those components. Why this matters: When Facebook acquired Oculus in 2014, Oculus explained that the social networking giant’s resources would allow the Rift to have custom parts instead of generic smartphone components. The teardown by iFixit gives a sense of exactly what users are getting from Facebook’s $2 billion acquisition and continued investments.